Microsoft seems to be working hard to stay ahead but the company did not always take the right decisions when it needed to. There are so many failed or canceled projects that Microsoft poured its resources into that we can't think of what the world would look like with all those products in it. The windows maker ditched a few smartphones, tablets and even a smartwatch. We've already covered the first two, so let's talk about the so-called Xbox smartwatch since images of the wearable device have just leaked online. Back in 2013, there were rumors that Microsoft plans to launch a Xbox-branded smartwatch. After testing a few prototypes, Microsoft decided to shelve the project, but some of these unfinished products continue to exist. Photos of a Xbox-branded smartwatch prototype have just emerged and the first thing noticeable is that it's oddly similar to Apple's original Watch, which seems rather strange since the latter was launched on the market two years later. 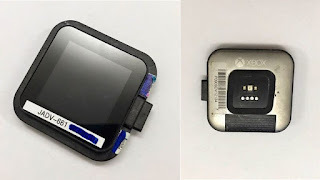 According to the source that leaked these images, Microsoft's smartwatch comes with a magnetic Surface connector. The wrist device would have a 1.5-inch display, 6GB storage, and replaceable wristbands. Microsoft should have released the Xbox-branded smartwatch sometime in 2015, but that never happened.